Last night I attended a fundraiser for Warren Furutani. It was held at the Holiday Inn in Torrance. Actually, it was in Harbor Gateway, which is that narrow strip of land running from L.A. to San Pedro that was put in place so that L.A. would officially have a harbor. There were around 50 who came out, composed of a sampling of white, black and Asian. 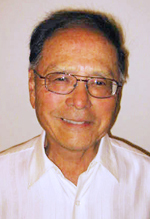 I talked with Don Hata, who is emeritus professor at Cal State University at Dominguez Hills. He spoke of a long history with Warren, going back to his college years. I recalled my involvement with Warren as he stood in the forefront of so many worthy causes. I told Warren how shocked I was at the L.A. Times’ endorsement of his opponent for the crucial City Council position. It was hard to believe the Times could endorse someone with so little experience in comparison with Warren’s experience with the L.A. Board of Education, the Community College Board of Trustees, and his strong record as state assemblyman. I also met Yuki Morita, the widow of Pat Morita. She is married to Isaac Scot and lives in the Valley. I got her email address so I could bring her up to date on some of the activities in our JACL chapter and the rest of the JA community in the Valley. Others I met were Mary Higuchi and Steve Iwakuni. I was pleased to have Mary tell me she reads my column in the Rafu Shimpo. Steve is a Sansei and it was good to hear him say he subscribes to the Rafu, and is encouraging his mother to subscribe as well. I told him from what I hear from others I know, this sounds like a real switch! It was no surprise to see Ken Inouye there. Good old gregarious Ken. He told me how he used to attend the Japanese American Republican Club. He volunteered to be an officer, but was turned down when they found out he was a Democrat! But, getting back to Warren. He told us last night that the timing of this election, right after the holidays, presents real concerns regarding getting people’s attention and getting them out to vote. I was shocked to hear that the voter turnout could be as low as 15 percent. To say that Warren has paid his dues in our community is surely an understatement. Marion and I have contributed to his campaign, and I am planning to spend a day volunteering on his behalf. “Lest we forget . . . Warren Furutani’s current bid for a seat on the L.A. City Council reminds me of his extraordinary lifetime commitment to social justice issues, not only for Nikkei and Asian and Pacific Americans, but everyone in our multiculturally diverse society. The L.A. City Council seat he seeks is a dramatically diverse mosaic of constituents, from Watts in the north to San Pedro and L.A. Harbor in the south. The district needs a representative with a demonstrated track record of bringing people together. “Warren is a bridge-builder and an honest broker. Warren has established campaign offices THROUGHOUT the district, from Watts to San Pedro. His young opponent is an enthusiastic newcomer without prior political experience but with generous funding, and his campaign focuses only on his home base in San Pedro. “The anti-incumbent mood throughout the nation threatens to throw out the baby with the bathwater, and it would be a real tragedy if we allow this to happen to a genuinely responsible and compassionate elected official like Warren Furutani. “I urge you to enable Warren to get out the vote in the run-off election on Jan. 17, 2012. As a special election, a low turnout is predicted, and that means every vote is crucial. We have all been asked to donate, but please consider one more check. Unfortunately, money is the mother’s milk of politics, but contributions of all sizes (nothing is too small) will help Warren get his message out to the entire far-flung district. “Volunteers are needed to distribute lawn signs, and fold and stuff envelopes for mass mailings. Yesterday I drove Warren’s mom-in-law Aiko Herzig-Yoshinaga and her sister Amy to Warren’s office in San Pedro. We got there when the office opened in the morning, and folded and stuffed envelopes all day until after the sun went down. “We were relieved by a very different group of volunteers — high school students from local schools, mainly Hispanic, most of them in their first political campaign. We left the office very tired, but even more inspired. Warren Furutani represents all the diverse peoples in his district, and those dedicated young students are learning to walk the talk … keeping alive the ideal of a participatory democracy. “Warren is personally involved, making phone calls seeking support, and out walking the precincts, with Lisa at his side. Successful political campaigns are ultimately very personal, and I recall walking precincts with Mas Fukai when he and I were Gardena city councilmen battling against wealthy special interests that sought to dominate city politics. The opposition was lavishly funded and outspent us, but on Election Day, we won, by a margin of two to one. Phil Shigekuni writes from San Fernando Valley and can be contacted by email. The opinions expressed are not necessarily those of The Rafu Shimpo.